The following should hopefully provide a very brief and updated recap (for those standing in line outside a Realtor's office waiting to cash in on the current mania), on the long term economic strength behind the current real estate "recovery." We know that pockets of the United States are back in a residential real estate bubble, euphoria, mania, hysteria, or whatever you like to call it when people's decisions become almost solely based on emotion and greed. 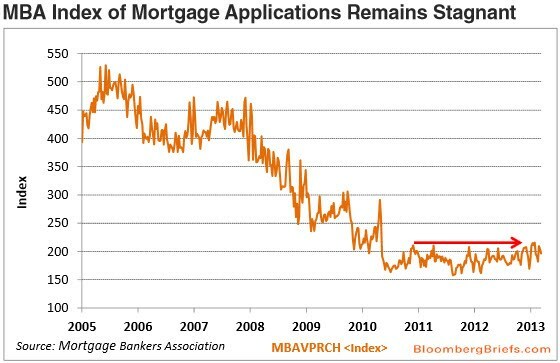 The fear of losing a dream home, or the thought process that someone will "miss out" on lower interest rates or these low prices has the country, in a few select markets, back in full madness mode. A strong, healthy, real estate market would be composed mainly of growing middle class families (having kids - need more space). They have a job that is going great, they have low debt, and they have a high amount of savings which allows them to put down a large down payment on the American dream. We have the benefit of economic data statistics to see if this is what is actually occurring across the United States and driving these real estate prices higher. We'll begin first with income growth. The chart below shows the US median income through the end of March. It collapsed after the current depression began in December 2007 and has not yet recovered. How could I possibly and irrationally use the word......depression.....in a country with a stock market that not only goes up every day, but goes up every hour? 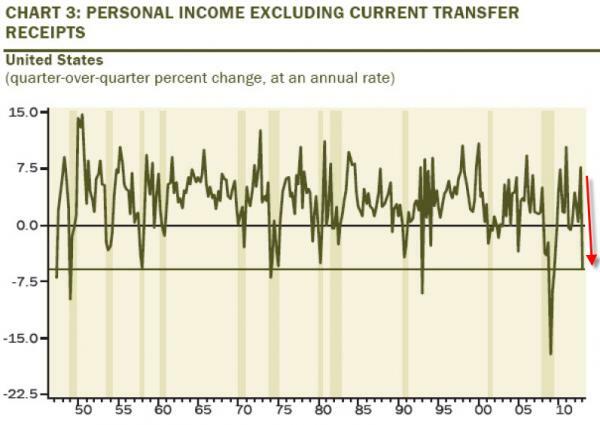 If you strip away the artificial government life support, and look at personal income excluding transfer payments, you get the very scary chart below showing a free fall back down to 2008 levels. 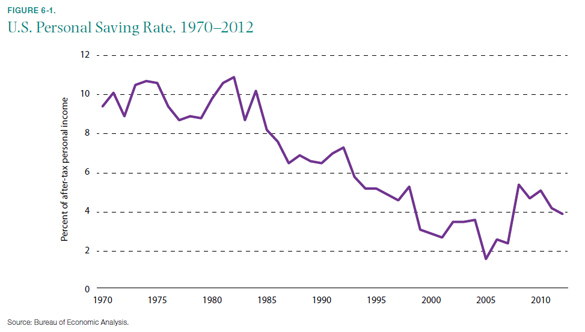 If Americans are not earning, at the very least we know that they are not piling on more unpayable debt, right? Didn't we finally learn that lesson back in 2008? Nope. 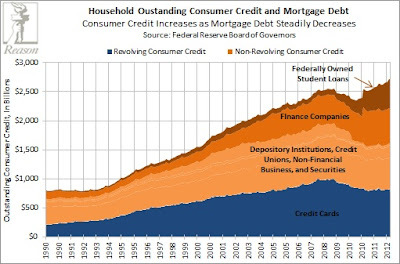 US consumer debt levels have now crossed back above previous record highs thanks in most part to the explosion in student loan debt (good luck for that generation getting a down payment on a home with hundreds of thousands in student loan debt and no job) and subprime auto lending. If you are good at math you can probably guess how the final component of healthy growth will look, but we will review it anyway. With income collapsing and debt soaring that obviously leaves little room available to save. 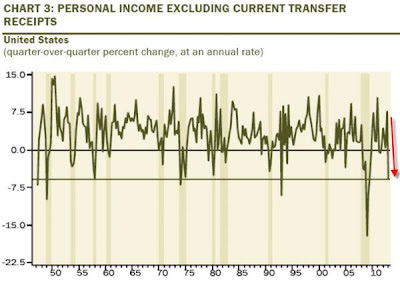 You can see the steady trend in America beginning in the early 1980's where the country moved from one of savings to one of borrowing. With no savings, it makes down payments on a home difficult. The chart below is a mirror image of the chart above. 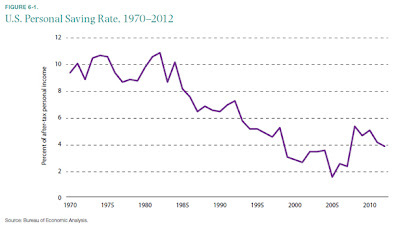 Savings were replaced with debt. 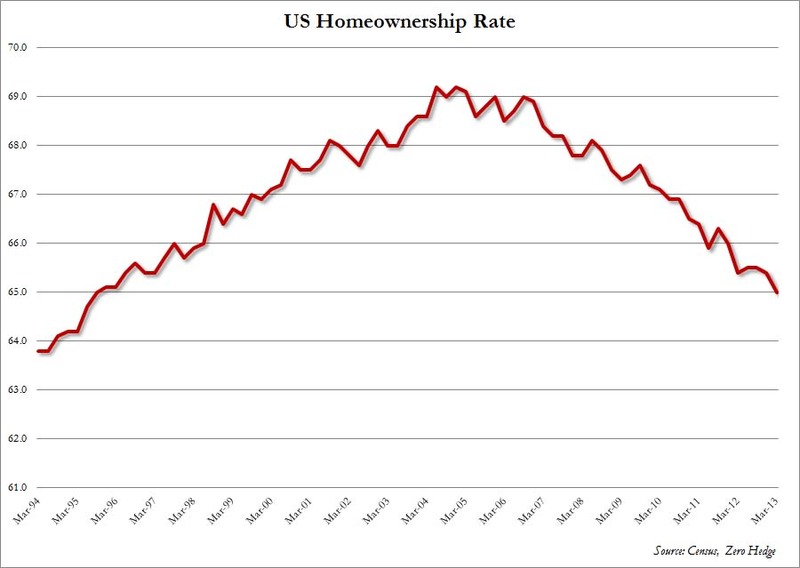 During the previous housing boom it was the average American pushing home prices higher, seen in the rising homeownership rate below. 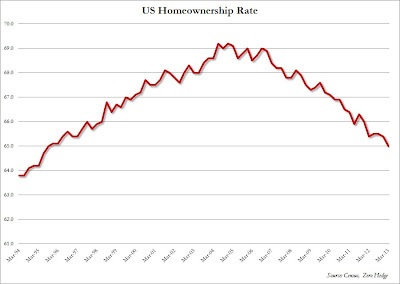 Housing prices bottomed in many areas in early 2012, but the homeownership rate has continued to fall, last month hitting a new post bubble low. 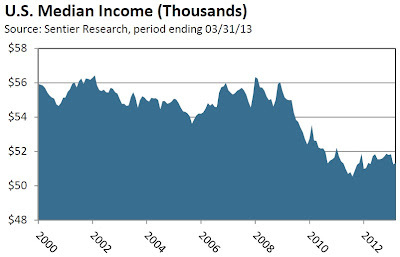 This shows it is not the average middle class family working family that is buying homes and pushing prices higher. 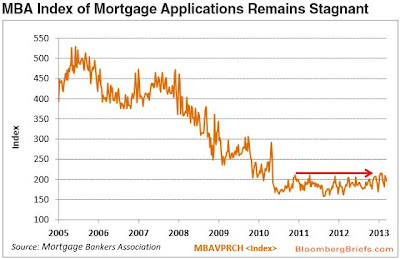 Another tool we can use to see that the average working family has not been involved with this recovery is the number of mortgage applications. When a family goes to purchase a home they take out a loan. This is not occuring. The actual cause of the recent price surge we have discussed in the past, but will review a piece of the story again briefly. 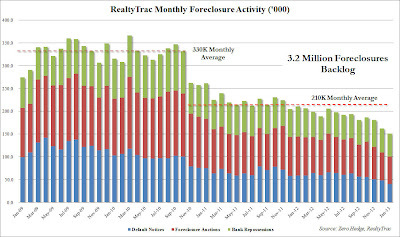 The number of homes being foreclosed on collapsed in September 2010 after the robo-signing scandal. This inventory has been held off the market now for close to three years creating an artificial shortage. 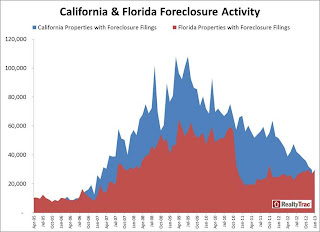 I know some people planning on eventually moving to Florida that visited an enormous community called The Villages in 2010 which was completely flooded with foreclosures and vacant homes. The median home price in this area fell from a high of $248,000 down to about $175,000 (about 30 percent decline), and has trended up to about $200,000 and held steady over the past few years. They are back visiting The Villages this week and it is a complete mania (see the recent surge in pricing on the chart above on the far right). A Realtor they spoke with told them that there is now only 1 foreclosure in the entire community (the residential area is the size of a small city). The Realtor said that home would probably be sold in minutes and that there are bidding wars on the limited supply of homes available. Where did this inventory go? 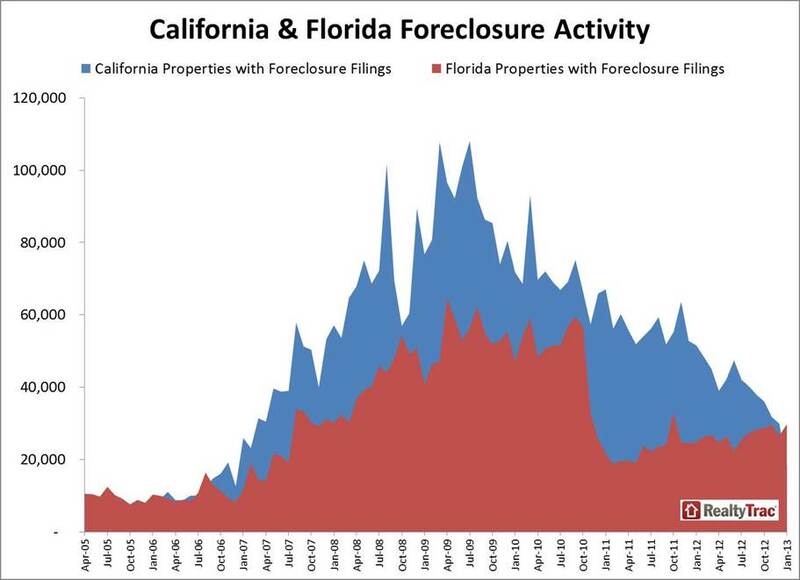 The red line on the graph below shows the collapse in foreclosures in Florida after the robo-signing scandal. These foreclosures never returned to the market. I have no idea what the number of bank homes currently in default are that are being held off the market in this specific retirement community. It could very well be zero as these Realtors are telling people. A retirement community is also a different type of market than your typical single family neighborhood (there is currently strong demand from retiring baby boomers). I was in a conversation about this particular neighborhood earlier in the week, which is why I use it as an example. Every market is different. The purpose of this disucssion is to think about the fundamental factors that would strengthen the real estate market as a whole and create a long term sustainable recovery against the actual factors taking place in the market today.